I recently decided to take another online course to improve myself. My initial thought went back to a fantastic course I took a few years ago about whole foods. The relaxed format of that previous course is what drew me back to Heather and her blog. There I found the perfect new course and exactly what my winter spirit needs. Hibernate. Hibernate, a course on relaxation and finding that inner joy and wellness we often lose in winter. 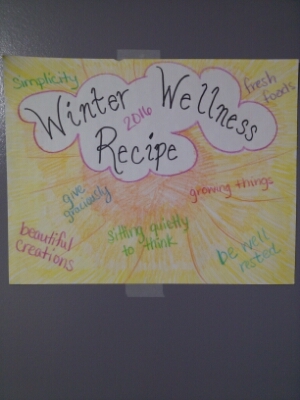 Step one, develop my individual Winter Wellness Recipe. This is a list of things that bring me pure joy in my life. Sitting in quiet really was challenging, with Tractor Man and Tag Along near by quiet is always a challenge, but I finally came up with a large list of things that bring me happiness. So here is what I have. A simple list of what brings me happiness and joy. I cannot wait to see what we do with it. I love how the course hostess, Heather,does such a great job of emphasizing the importance of finding joy in what we do as individuals. While this course is just getting started I wanted to sing its praises, incase you need this course as much as I did. It is not to late to join. You can find the course here, Hibernate. I would encourage anyone out there who is currently feeling stressed to take this course. There is NO real homework obligations but it is always nice to try a new thing or two. I’m currently considering a vision board. Anyone out there tried these before? Logging into the class each day gives me something joyful to look forward to. I can actually feel a sense of calming peace wash over me just reading the daily notes and ‘assignment’ for the day. The pictures and writing style only help to further the calming environment. While this is only one area of my life I am currently able to bring peace and calm to I am working on spreading it throughout our home. This last weekend we participated as a family in an at home retreat. Tractor Man, Sir Swine and I all sat down and took turns saying things that brought us joy. We made a list and the next two days just checked one fun thing after another off of our list. It was a wonderful time and good family bonding as well. While I know that this is a course that is only a few weeks long I am thankful that I am doing it. Sometimes we need to be reminded to slow down and put ourselves first. It is not being selfish to try to relax, enjoy time alone or with family. It is not wrong to want to just do nothing for a day. We can hibernate too, just without the drool and sleep part. I hope you are all enjoying a nice peaceful, restful winter season. Happy homesteading.